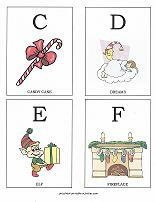 Printable flashcards are a great way to teach the alphabet. 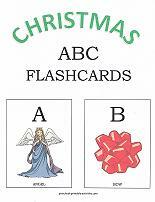 Even better, during the Christmas season, are flashcards with a Christmas theme. 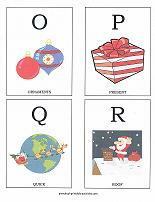 This set has 26 flashcards, one for each letter of the alphabet. 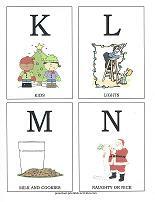 Each letter also has a child-friendly picture of things children may see during the holiday season. I recommend printing the cards on card-stock paper and laminating them. 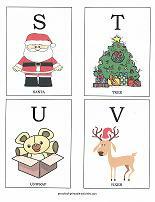 Preschool flashcards are easy to make, and best of all, they are portable! They can be used anywhere! Flashcards have routinely been used as a learning and teaching tool, especially when introducing new concepts. 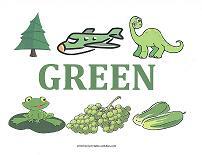 Printable flashcards give children the chance to learn basic elements and memorize them. Short lessons, over time, produce the best results. 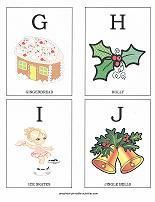 Lay several cards face-up on a table and ask a child to find a particular letter. Continue until all letters have been found. Have the child help you put them in alphabetical order. Singing the alphabet song during the process makes it even more fun. Make two copies of the cards and make a match game. Mix both sets together. Flip them all, picture side down, on a table. Let one child choose two cards. If the cards match, the child gets an extra turn. If they are not a match, the cards are flipped back over... and another child gets a turn. Continue until all matches are found. 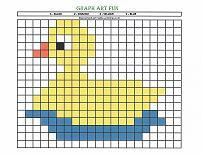 Place cards in a dollar-store photo album or glue to colored paper and staple together to make an ABC book. 12 Days of Christmas Song – Twelve counting wall cards. One for each verse of the song. A great visual aid for counting. Twelve coloring pages, one for each verse. And, all the lyrics to the song. Because each verse builds upon the last one, it’s not a difficult song for preschoolers. Printable Christmas Mazes – Several mazes to choose from, all with a holiday theme. Basic mazes, and alphabet and number mazes too!